Does this sound familiar? You show up at the office early, stay late, and give your all while you are there day-in and day-out, but you are still not being adequately recognised at work? Or you see less skilled colleagues getting the promotion/recognition/salary YOU deserve? Or you’ve sacrificed a lot for your career – especially your own self-care and time with family and friends – and it still has not translated into the career success you desire? It can be exhausting, frustrating, and downright hard to understand. 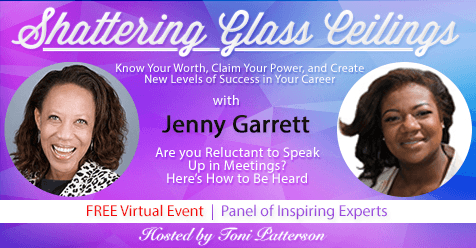 If you are over being passed over for promotion; tired of feeling like you are running in place on your path to greater success; and ready to find a seat at the table of your own corporate career, then join Jenny Garrett and Toni Patterson on the Shattering Glass Ceilings virtual interview series and gift giveaway! Their collective goal is to provide ambitious, driven career women with the tools to truly Know Your Worth, Claim Your Power, And Create New Levels of Success in Your Career. “Success” can mean more money, more recognition, more control over your schedule, a promotion, or something else. But whatever it means to you, you have within you everything you need to achieve it. Jenny Garrett and Toni Patterson, and the other amazing experts on the interview series will show you how. Sign up today to reserve your spot now so you can take advantage of the entire event, including all of the advice and tested strategies offered by each expert, as well as the FREE gifts!